Addiction Signs of Drug Addiction The beginning signs of drug addiction or abuse can be hard to notice since drugs affect people differently. Drug addiction can alter a person’s thinking and their physical and mental health. 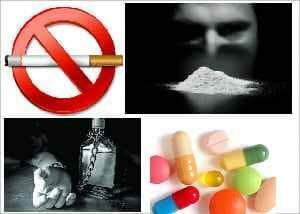 Abuse of, or being addicted to, illegal drugs or prescription medications can lead to a lack of self-control. The drug user’s personality may change, all to often turning them into someone we no longer seem to recognize. Most outsiders don’t realize there is a difference between drug addiction and drug abuse, nor do they recognize the warning signs. Most people who abuse or have an addiction to drugs try to cover up their behavior by downplaying their actions. Drug abuse is the inappropriate use of any substance. The improper use of alcohol, over-the-counter medicine, prescription medications or illegal drugs used for pleasure, altering feelings, perceptions, or to receive a high is drug abuse. Drugs and alcohol also trigger “pleasure” or “happiness” in the brain. The more alcohol or drugs used, the less the body produces its own dopamine and expects more drugs or alcohol to do the job. By this point, your mind is being programmed to seek out the “feel good” substances. Simply put, drug abuse leads to drug addiction because the substance creates a dopamine “spike” that changes the way the brain functions. Advance Hypnosis Clinic’s Nationwide are leading the way in addiction recovery strategies utilising ground breaking techniques in mind resolution and mental cognitive rehearsal. Tel: 1890-987888 to speak with our resident therapies advisor. What’s makes the Hypno Health Programs so successful? Dalai Lama: What is the Purpose of Life? GETTING READY FOR YOUR NEW YEAR AND THE NEW YOU WHEN IT COMES TO LOSING WEIGHT. © 2018 Advance Weight-Loss Hypnosis Clinics All rights reserved.